It’s only been 3 days of working willingly, (wwoofing means willing worker) in trade for 3 square meals a day + 2 tea and scone breaks and a tent site. Geez the Aussies live civilized with all the breaks….it makes me want to work more as I don’t run out of energy. (i’m sure i’ve already gained weight, but oh well). So far, I have assisted in harvesting CHIA SEEDS for our booth at the Farmers Market for the upcoming weekend at the infamous markets at ‘The Channon”. I am sleeping in ‘la tent beautiful’ with a view that goes forever across the ‘bush’, complete with the perfect ‘pee’ bucket (thanks to sista sally who provided me with tent + trimmings (hot water bottle) for plush outdoor living) so that I don’t have to get up in the night in the cold. What a relief, especially for a woman. We are 5 wwoofers and 10 interns learning everything there is to know to start your own ‘food forest’/sustainable farm. 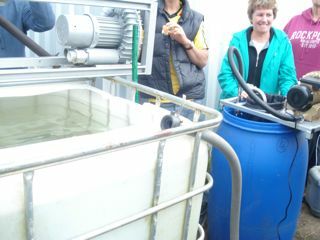 I have learned how to make ‘Compost Tea’ with Paul Taylor, which is essential for rehabilitating our poor soils and which provides the foundation for the best food possible. I have added mud (clay + chaff + sand) to the straw bale house – rendering (sand, hydrated lime, clay) it to the Finish. I have built fences (recycled tin sidings to keep out chooks) for the new veggie garden that was re-tooled for the amount of water that has come from the sky over the last bit of time, allowing it to run-off instead of ‘sitting’, thereby feeding other plants lower down that don’t mind a ‘bog’. Hmmm, I wonder what we’ll do tomorrow. There are people here from all over the world learning from the best in their fields that pertain to anything farming, permaculture, land and energy – without using fossil fuels. We are totally on solar power with an ingenious set-up that is master-minded by our very own Chris Darker. Isn’t that a great moniker to have for what he does? 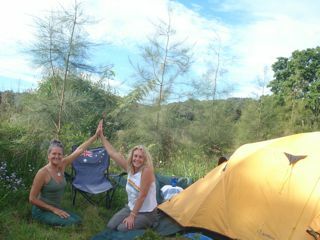 There are 10 covered tent sites with platforms for all the students that come and go from here, as its one of the foremost training Institutes in the world; The headquarters for the Permaculture Research Institute of Australia. In 10 weeks you can learn all you need to go live a sustainable life, growing your own food with the best techniques known for the healthiest crops as well as the energy and recycle concept that everything runs on. Check it out now and save yourself as well as your children’s children. 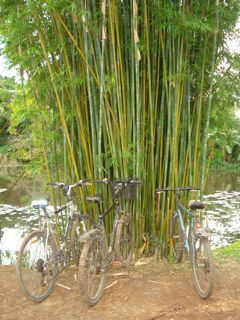 Now this is what I call A Sustainable Bike Rack Extraordinaire !